For every possible type of terrain, there's probably a bike designed to handle it. Pavement and trails have very different surface characteristics that demand a specialized bicycle. The road bike, designed for pavement, has over a century of racing heritage and is the predecessor of every bicycle since. Mountain bikes were conceptualized much later, but they make up a substantial part of bicycling and come in a wide variety of styles and builds for tackling the toughest terrain. A road bike is designed to be lightweight and responsive on smooth pavement. These bikes have thin 700c-sized wheels and thin tires, which reduces rolling resistance and increases speed. In competition, racing road bikes are engineered for performance to shave seconds off a rider's time. Road bikes place the rider in an aggressive, forward-leaning position that improves aerodynamics and power transfer to the pedals. The frame needs to be light and rigid, so especially strong materials like carbon fiber and titanium are common at the competitive level. Other durable and light materials like steel and aluminum round out the consumer market. Mountain bikes are designed to conquer off-road terrain like dirt, mud, snow and gravel. These bikes are built especially tough, with thick tires and strong wheels that resist damage from impact. The frames are made from aluminum, carbon fiber, steel and titanium, and are built to withstand a lot of punishment. Suspension systems allow the wheels to absorb the vibration and impact from rough trail. A hardtail mountain bike features suspension in the front, while a full-suspension mountain bike has shock absorption for both wheels. 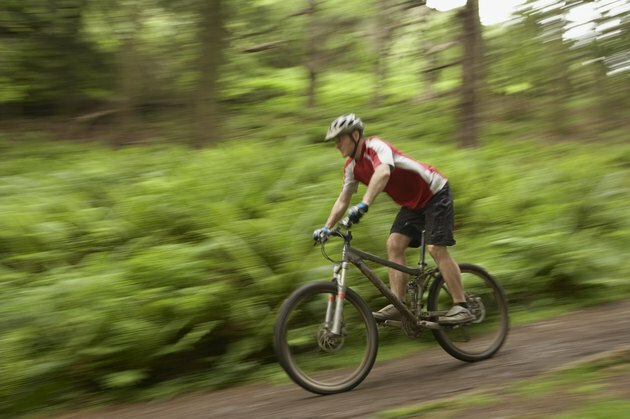 Mountain bikes usually feature flat handlebars, which place the rider in an upright position for balance and control. The most immediate difference between road and mountain bikes are the wheels. Mountain bike wheels come with 26- to 29-inch options, and always feature tires with raised lugs. These lugs act like teeth for loose soil, digging in and providing traction and grip where the smooth tires on a road bike would slip. A road bike uses narrower tires without lugs, which provide adequate grip and control on the pavement. The characteristics that make mountain bikes much more comfortable off road also translate to pavement and bike paths, making them a popular choice for casual commuters. It'll never go as fast as a road bike, but the riding position and shock absorption make short work of potholes and curbs. Road bikes are the ideal choice if you ride exclusively on pavement and want a faster bike, as they'll make pedaling and climbing hills much easier. Their light weight also makes them easy to control at higher speeds. How Much Lighter Is a Carbon Bicycle Frame Than an Aluminum One?